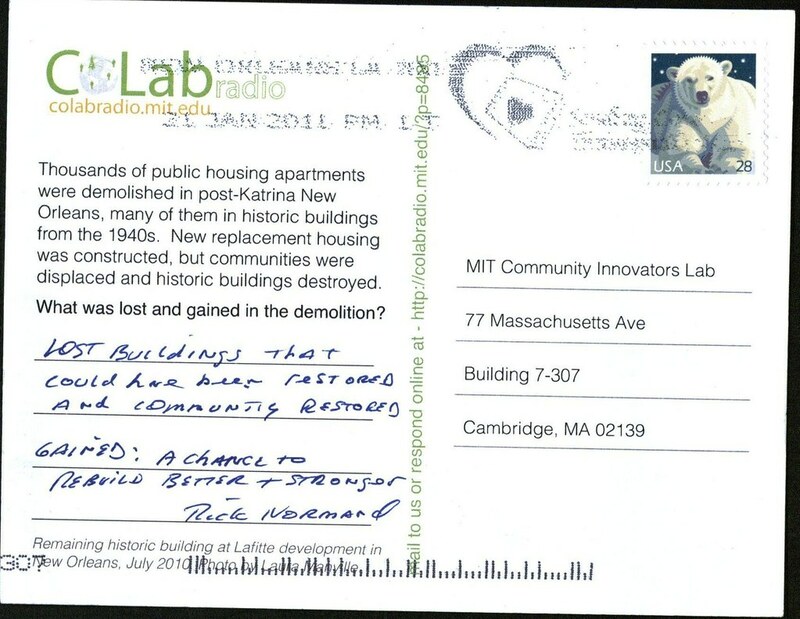 CoLab Radio » Blog Archive » After Katrina: A chance to build better and stronger? Some came back crumpled, and some took their time coming back east, but as of today we’ve received five postcards back out of the 100 we printed. In the coming weeks, I’ll post them as I blog for CoLab about my thesis. The first card I’ll share resonates with me because if its ambivalence. My thesis is about the historic preservation of some public housing structures in New Orleans after Katrina. These buildings were preserved at a time when hundreds of others were being demolished to make way for new mixed-income communities. 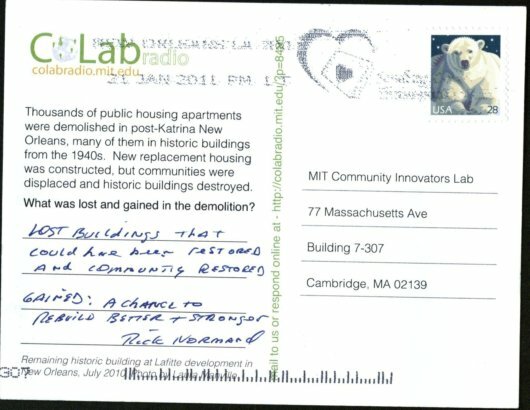 While some stakeholders wanted to try to restore all the buildings, and to keep these communities mostly as they had been before the storm, others were convinced that there was a better way to build public housing. Some of those involved in the development of the new communities argued that public housing residents deserved new buildings, not the old ones. Others felt strongly that the historic buildings represented a history that was important enough to commemorate through rehabilitation. As this postcard says succinctly, both sides could be right. The one or two buildings that remain and will be preserved on each of the public housing sites represent a compromise—albeit a small gesture to those advocating for community or building preservation. My thesis explores how this compromise came about, and how different parties understood the concept and value of historic preservation in the context of redevelopment. Hi Laura, it’s great to see your post here and hear more about your work in New Orleans! Hope you are having a great semester.